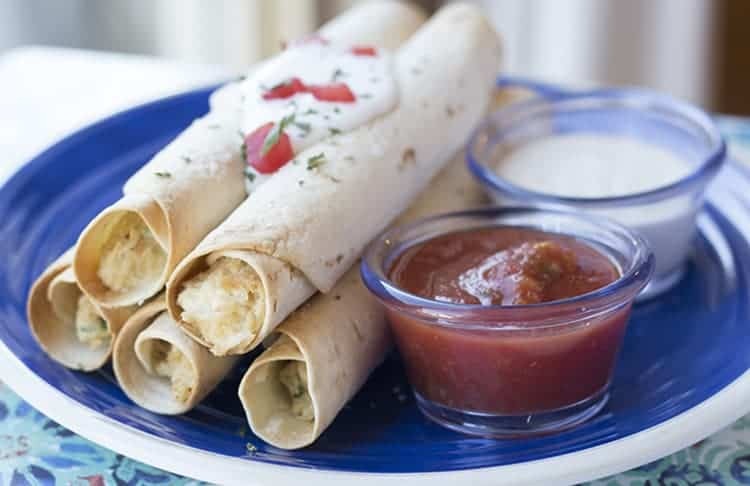 I was first introduced to taquitos while I was living in Washington state several years ago. One bite, and I was instantly in love! There are many different variations out there, which just goes to show how popular these are! 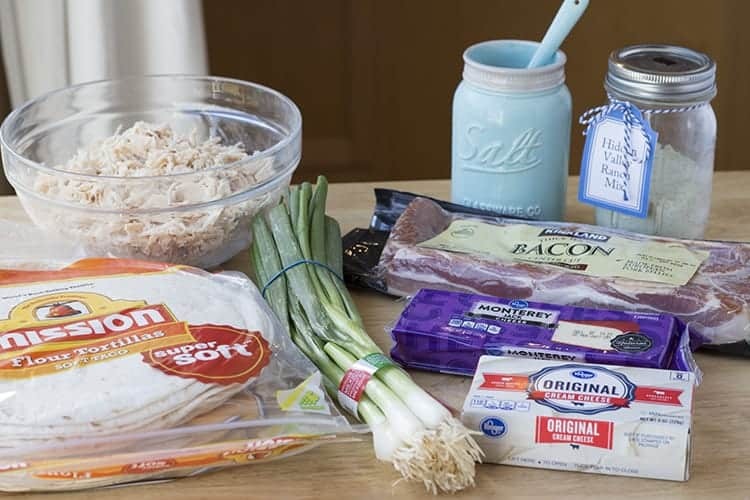 This recipe was shared with me awhile back, and it has fast become one of our favorite make-ahead freezer meals. It is quick to pull these together, and you can make as many or as few per meal as needed – great for singles or those with smaller households! The best part is that these cook right from frozen – no thawing necessary!! The original recipe comes from the very talented ladies at Six Sister’s Stuff, and my family will forever be grateful for their delicious offering to the taquito-loving world! 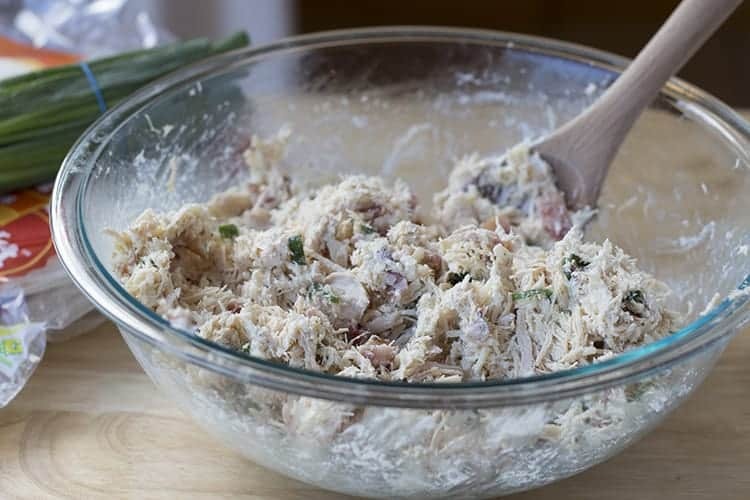 To save time, I use my canned chicken, but you can use a rotisserie chicken from the grocery store or just pre-cook some chicken and shred it. You’ll also need to cook your bacon (or I sometimes just use pre-cooked bacon from the store when I’m running short on time). Don’t forget to pull your cream cheese out of the refrigerator beforehand so it can soften to room temperature. If you forget (which I often do), you can soften it by putting it in your microwave (unwrapped, of course) on low power for a few seconds at a time until you get it soft enough. Make sure all of your cheese in incorporated into the mixture, and that there are no pockets of cream cheese left on the bottom of the bowl. You don’t want to waste any of that creamy goodness! Next, lay out a tortilla and place about 2-3 tablespoons of the filling mixture onto the tortilla in a narrow line about and inch or two from the end. The mixture is pretty sticky, so you may end up sort-of forming it into a line with your hands. Lift the edge of the tortilla closest to the filling, and gently drape it over the filling. 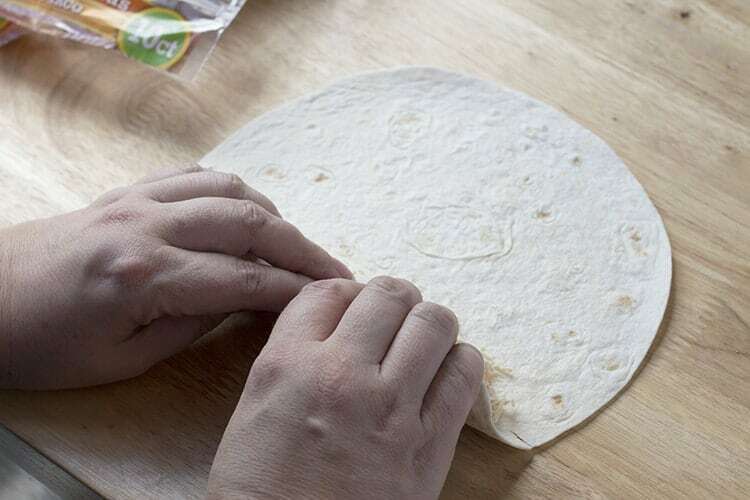 Carefully roll up your tortilla, trying to keep it as tight as possible. 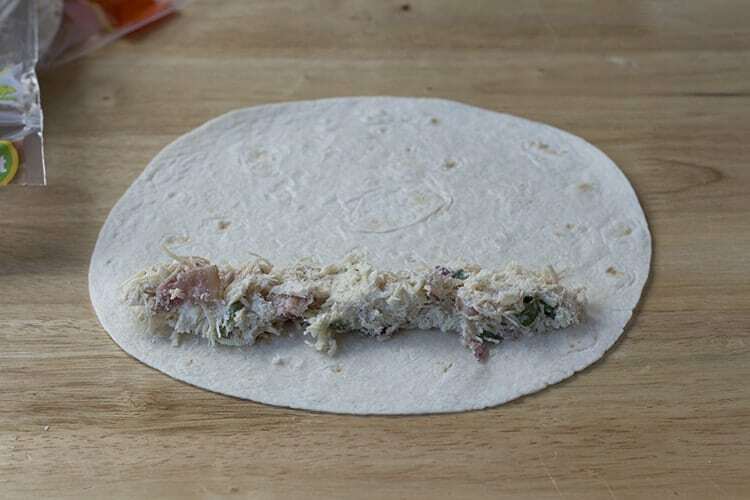 Eng by placing the rolled tortilla seam side down on your work surface. Now, on to the next one! 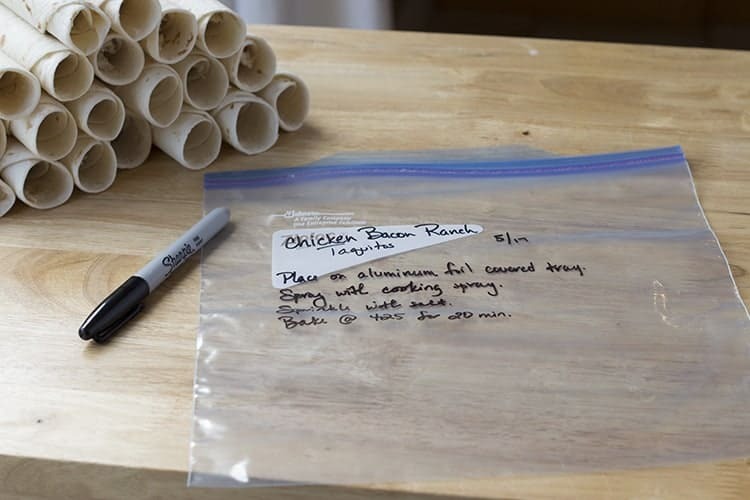 Once you’ve got all of your tortillas rolled, grab a gallon-size freezer bag and label it with the pertinent information. Don’t forget to put the reheating instructions on there! Then tuck these creamy little bundles of joy in for a long nap in the freezer! Place your desire amount of taquitos onto a baking sheet lined with aluminum foil. Spray the taquitos with cooking spray, and then sprinkle lightly with salt. Do not skip this step – it makes a world of difference! Bake at 425F for about 20 minutes, or until lightly golden on the top. 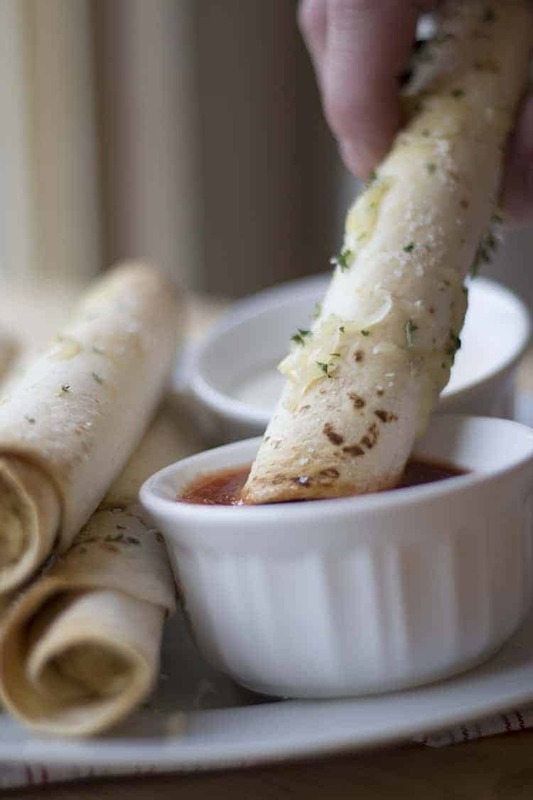 Serve with your favorite choice of toppings and/or sauces for dipping! My family loves to have them plain and dip them in salsa or ranch, or even salsa ranch!! 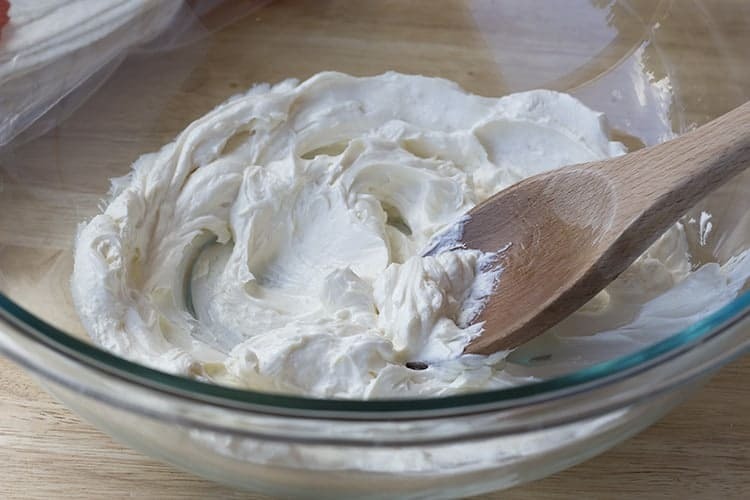 Place softened cream cheese into large bowl and stir until smooth (to remove any lumps). 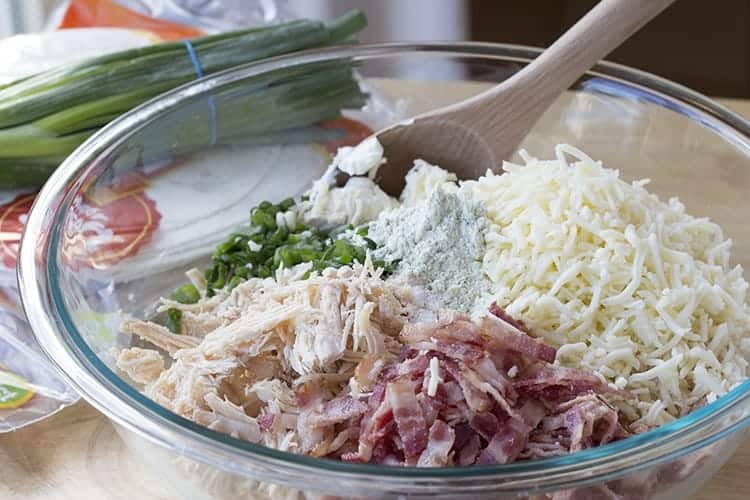 Add in chicken, bacon, cheese, onions and ranch dressing mix. Stir to combine. Taste, and add salt or more ranch dressing mix if needed. Place 2-3 tablespoons of filling mix onto a tortilla, in a thin line near one edge. Wrap the edge of the tortilla over the filling mixture and roll tightly, ending seam-side down. Repeat with remaining tortillas. 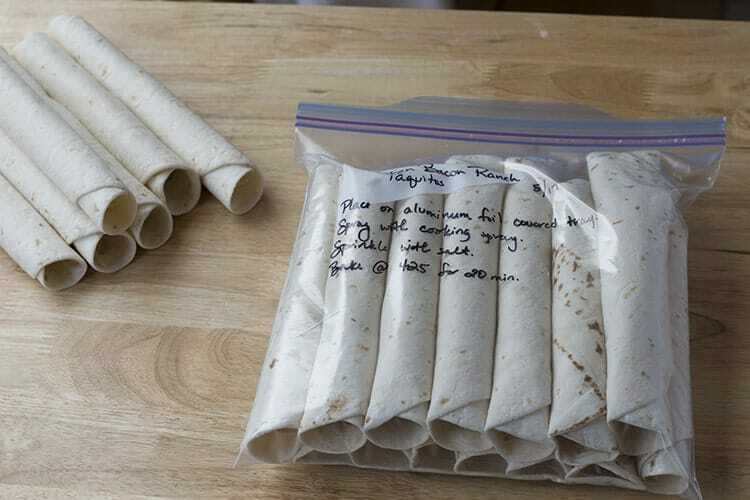 Label a gallon-size freezer bag and place rolled taquitos gently in bag. Freeze until needed. 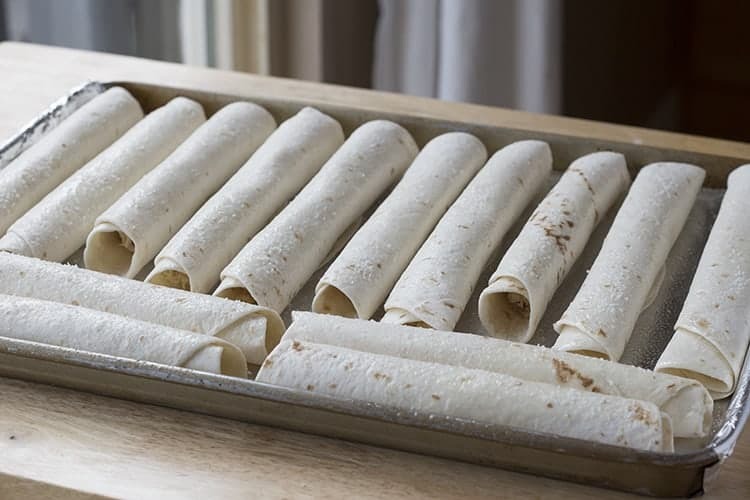 Place frozen taquitos onto a foil-lined baking sheet. Spray with non-stick cooking spray, and sprinkle lightly with salt. Bake at 425 degrees Fahrenheit for 20-25 minutes or until lightly golden brown. Serve with your choice of toppings (shredded lettuce, sour cream, chopped tomatoes, etc.) and/or dipping sauces (salsa, ranch dressing, etc.). Let me know if you do and what you think of them! Looks yummy! Is that homemade ranch mix? Do you have the recipe for that on your blog? Yes, I use my homemade ranch dressing mix in this.